This is my latest project, it is a pattern that can be used for Tapestry Crochet and Regular Crochet. The trick will be what kind of yarn you use. Each of my hats has a name the Green one is Called the Rotterdam Sonnetto, the one with variegated Purple,gold and other colors is called the Amsterdam Sonnetto. They are a set from my first pattern for sale. You get two patterns in one. This is a great Deal and I will be putting the pattern for sale soon at Ravelry! Or you can Purchase it from me using Paypal directly, is on the sidebar. You can contact me at---> Crafty Andy Designs for any other information or questions about the pattern. The patterns are $5.00 in USD at this time and are in PDF Format, no physical shipment of a publication is offered. You will need the latest FREE Acrobat Reader, which you can download from HERE . The PDF's are smaller with the most current PDF Reader from Acrobat. 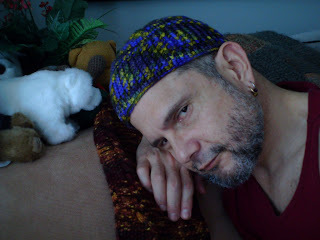 The above hat is made with some scraps of hand dyed wools, some angora and some malabrigo. The hat Below is made with one Skein of Malabrigo both with an F hook, 3.75, but the beauty of this pattern is that you can adapt it to the yarn and the hook that you are using easily.